1. Place the quinoa in a fine sieve, and under cold water until the water is clear (not cloudy), then leave to drain through a strainer for around 30 minutes. 2. Add the quinoa to a saucepan with 450ml cold water. Bring to the boil, then cover and simmer on a low heat for 20 minutes. Remove from the heat, carefully fluff with a fork, then leave with the lid on to settle for 10 minutes. 3. Pour the quinoa onto a large platter, and coat all the grains with sushi seasoning vinegar. Then cool down the quinoa as soon as possible. Do not over stir as it will become mushy. 5. 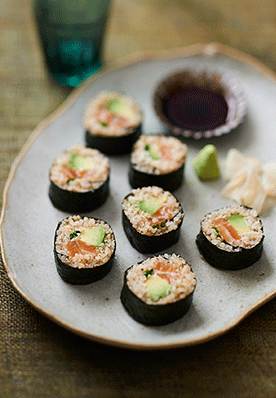 Prepare your fillings: salmon, avocado and chives. Cover a bamboo rolling mat in cling film, wrapping over a couple of times. Fill a small bowl of water for sealing the edges of the nori sheets. 6. Place your rolling mat in front of you, cut off two sections from the top of the seaweed sheet (you will see an indentation) then place on to the rolling mat shiny side facing down about 2cm from the edge. 7. Divide the quinoa into seven heaps so you have enough for each roll. Collect one heap of quinoa and place on the prepared seaweed sheet. Spread the quinoa evenly, leaving a 1cm margin at the top uncovered. Flatten the quinoa and make neat at the edges. 8. Place the mayonnaise 2cm from the closest part of the seaweed towards you along the width. Then place your fillings. Do not overload. 9. Lift the near edge of the rolling mat and fold it over the filling (holding the filling in place with your middle and forefingers, aiming to meet the top edge of the quinoa. Roll over approximately three times. Lift the mat to uncover the roll and remove your fingers from inside the roll, continuing to roll until the two edges of the nori sheet meet. Dip your fingertip in the water bowl and seal the top of the nori sheet. Cover the roll with the rolling mat again and press along the length a couple of times, before removing the mat. 10. Place the rolls to the side until you have finished rolling, then using a serrated sharp knife, (and wiping the blade with a damp cloth to stop the quinoa from sticking) cut in the centre, then each half in two. Cover a bamboo rolling mat in cling film, wrapping over a couple of times, to prevent your fillings getting caught in the mat. This way it keeps your mat nice and clean.